With the 2018 Taipei Marathon taking place on Sunday, December 9, the city government has announced various adjustments to the local public transportation network during the event. For MRT, the first train will depart the respective terminal stations at 5:20 AM. The interval between trains for the Bannan Line will be 8 to 10 minutes; the Wenhu Line will be 6 to 7 minutes; and 10 to 15 minutes for the other lines. 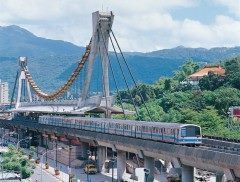 The Xiaobitan Branch Line and Xinbeitou Branch Line will operate starting at 6 AM. Furthermore, the platform TVs at all MRT stations will broadcast the marathon event via live streaming from 6:30 AM to 9:30 AM on December 9. Regarding public bus services, the Public Transportation Office (PTO) pointed out that a total of 205 bus routes, as well as various intercity buses, will be required to make detours or skip stops during the marathon, affecting a total of 441 bus stops across the city. For more information on the details, please visit the Chinese website of the marathon (https://www.sportsnet.org.tw/schedule.php). PTO also reminds the public that there may be possible delays and doubling of travel time for affected bus services due to traffic control measures. They can either make allowances for the additional time or avoid traveling during the marathon period. For more information on MRT operations, please call the 24-hour hotline of TRTC (TEL: 02-218-12345) or visit the company’s Chinese website (http://www.metro.taipei/). For details on bus service adjustments, please call the 1999 Citizen’s Hotline or visit the Chinese website of PTO (http://www.pto.taipei.gov.tw).